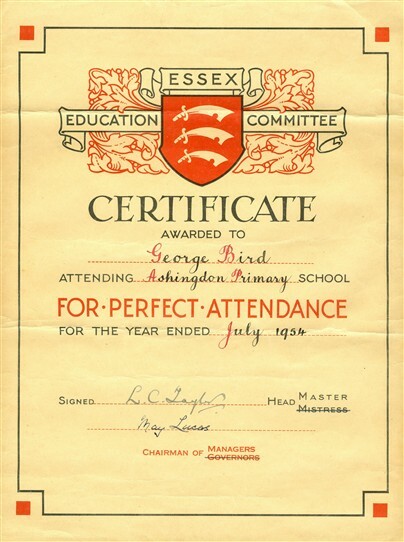 George Bird is now a resident of Benfleet. This page was added by Ronnie Pigram on 15/09/2012. 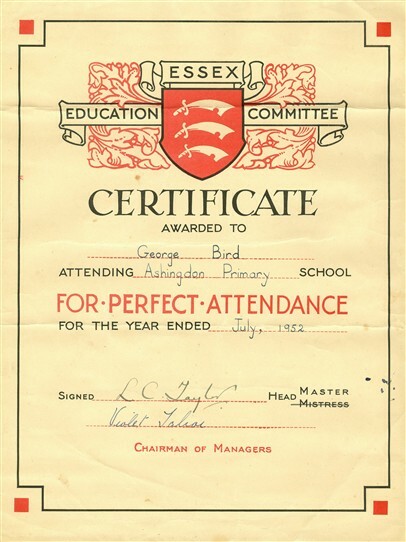 I found these certificates whilst cleaning out a cupboard.I showed them to my neighbour Mr Ron Pigram who offered to put them on this site.I actually achieved 4 years perfect attendance,but unfortunately the other certificates have been mislaid.My first teacher was a Mrs Krujinski,and other teachers at that time included Mrs Colenut,Mr Lynn,Mr Collins and the Headmaster was Mr Taylor.It would be great to hear from any pupils who attended Ashingdon Primary at that time.A few names that come to mind are Richard Simmonds,Ray Bines,Willy Catton,Violet Godsafe,Elizabeth Way,Wendy Gunn and Christopher Webb also The Cunninghams Ray and Ellain.